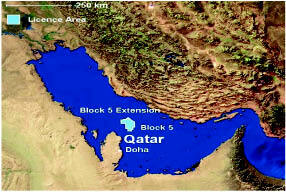 Maersk Oil Qatar AS (MOQ) completed drilling the world-record BD-04A well in May 2008 offshore Qatar. It was the successful outcome of engineering efforts to increase extended-reach capabilities. MOQ started to develop the Al-Shaheen Field offshore Qatar in 1994 with horizontal drilling techniques pioneered by Maersk Oil & Gas AS in the North Sea. 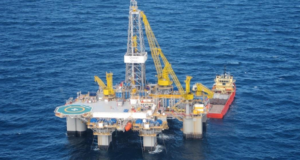 In May 2008 the BD-04A well was completed with a record horizontal length of 35,770 ft. This well also set world records for the longest well at 40,320 ft MDRT and the longest along-hole departure of 37,956 ft. This case study will review the history, challenges and planning through the drilling of the well. It will outline the achievements, practices and engineering analysis of field data where key learning points have been shared. 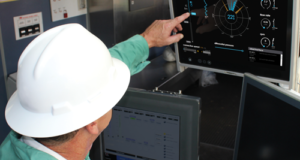 It will show that even when constrained by limitations such as rig capacity, major step-changes can be achieved by optimizing basic operating parameters. Web-only graphic: Block 5 and Block 5 Extension location map. 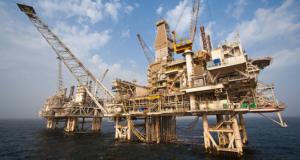 MOQ operates the Al-Shaheen Field, Block 5, under a production sharing agreement with Qatar Petroleum (QP) . The exploration and exploitation rights include all Block 5 geological formations above the Khuff formation. The main targets comprise the Lower Cretaceous Kharaib B and Shuaiba carbonate formations and the Nahr Umr sandstone. The Kharaib Formation is a laterally uniform carbonate deposition. Its thickness is generally 80 ft, with a reservoir target of some 25 ft. The Shuaiba Formation exhibits lateral facies changes and permeability contrasts. Its thickness is generally 200 ft, with a reservoir target of some 20 ft. The Nahr Umr Formation is a 20-ft sand sequence with reservoir targets of some 5 ft or less of permeable sand. The decision to develop using long-reach horizontal wells was primarily driven by 1) the large aerial extent of the accumulation, 2) poor productivity of vertical wells, and 3) number of platform locations required if a conventional approach with vertical or slant wells was pursued. The length of these horizontal wells has been extended during the course of the development, and some of these wells are pushing the limits of what can be achieved with today’s technologies. Extension. BD-04A was drilled in the Kharaib B reservoir. In 1994, when Well ALS-3 was drilled to 16,061 ft in the Al-Shaheen field, it was a record-breaking well with a horizontal length of 10,220 ft. This was achieved with conventional directional drilling equipment such as mud motor and adjustable gauge stabilizers; rotary steerable technology was not available yet. The evolution of equipment and procedures has aided the expansion of extended-reach drilling in the Al-Shaheen Field. There has been an ongoing development of solutions to new problems at each additional step-out in well displacement. As new tools became available, fit-for-purpose technology was applied and additional reach accomplished. To further enhance the oil recovery from the Al-Shaheen Field, MOQ in 2007 accepted the new challenge of drilling even longer wells and initiated measures with detailed engineering analysis to expand the horizontal extended-reach drilling envelope beyond the industry experience. The approach of continuous “pushing the limits” sustains the drive to pursue new technologies and innovation in its well design and operations, eventually leading to the record-breaking BD-04A well. (1) At 40,320 ft MDRT, it is the longest well ever drilled, hence also achieving the longest reach of 36,238 ft.
(2) The longest horizontal section of 35,770 ft (i.e., from the first survey above 86.0° inclination at 4,550 ft MDRT to TD at 40,320 ft) with 35,449 ft of continuous reservoir exposure (9 5/8-in. casing shoe at 4,871 ft). Longest 8 ½-in. section of 35,449 ft. Longest length drilled with a rotary steerable BHA and LWD. Highest reach vs TVD (ERD) ratio of 10.48. Longest acid stimulation job (17,610 bbl of acid used). Highest Directional Difficulty Index of 8.279. The BD-04A well is a line-drive pattern producer targeting the Kharaib, KB-1a reservoir sub-unit along the entire horizontal section. The objective of this well was to drain the area south of the BA-33 Kharaib well. It is the southernmost producer in the line-drive pattern of the current development phase. This graph provides a vertical section view of the BD-04A well path. BD-04A was substantially longer than planned. The original TD was programmed at 28,850 ft. 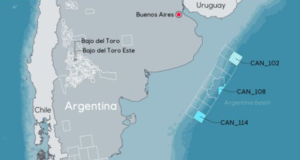 However, that was extended to 40,320 ft to appraise the eastern flank of the B-location and to increase the exposure of single well in the reservoir. A controlled 35° azimuth turn was made as per the revised / extended plan to align the well with the next development phase line-drive pattern wells. BD-04A was drilled within the limits of a relatively small rig package. It had 2 x 1,600-hp pumps with an effective surface pressure limit of 4,000-4,200 psi and a TDS-4H top drive capable of 40,000 ft-lbs of torque at 120 rpm. The derrick racking capacity is limited to about 17,000 ft, or 181 triple stands of 5-in. drill pipe. 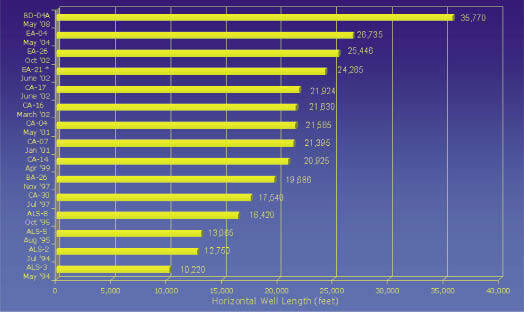 The catenary well profile (with a planned dogleg of 3.0°/100 ft maximum) in the top 16-in. and 12 ¼-in. hole sections was drilled utilizing push-the-bit rotary steerable assemblies and optimally landing the well horizontally (89.8º inclination) in the target Kharaib reservoir at 4,881 ft MDRT (3,482 ft TVDRT). The 9 5/8-in. casing shoe was set at 4,871 ft. The advantages of using the rotary steerable in these sections are smooth wellbore curve, less tortuosity, good hole cleaning and the ease of running casing. 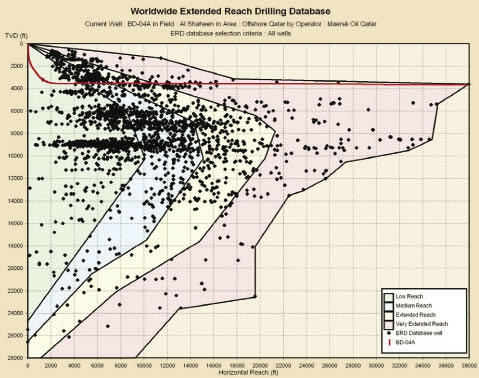 This graph plots the industry extended-reach drilling experience worldwide, overlaid with the BD-04A well path. The mud used in the 8 ½-in. reservoir hole section was a non-formation damaging low-solids non-dispersive (LSND) water-based mud system weighted to 9.3-9.6 ppg with sodium chloride (NaCl) or calcium carbonate (CaCO3). Rheology, especially low-end rheology, was maintained using Duotec to ensure good hole-cleaning properties. Static and dynamic fluid loss was controlled with PAC-UL and Polysal in the initial build phase and thereafter maintained with Polysal throughout the section. On several occasions, the use of high-viscosity sweeps for improved hole cleaning proved to be efficient in this section. The LSND mud system exhibits two important characteristics that are critical to the success of the well: a) hole cleaning was fairly easy to achieve and b) more importantly, hole enlargement with time (BD-04A and offset wells have consistently shown hole enlargement up to average hole size of 9 ½ in. to 10 in., either inferring from lower equivalent circulating density (ECD) values from PWD logs or direct measurement from ultrasonic caliper logs). This is integral to ECD and torque management. After initial problems maintaining the required azimuth direction when drilling out of the 9 5/8-in. casing shoe at 4,871 ft to 5,392 ft MDRT, an early sidetrack had to be made just below the shoe. The sidetracked hole was then drilled in two BHA runs to the record TD of 40,320 ft. The first part of the 8 ½-in. horizontal reservoir section to 23,630 ft was drilled at an average ROP of 221 ft/hr with the push-the-bit rotary steerable and insert bit. Downhole static losses were reported at 8-12 bbls/hr. Geosteering with assistance from LWD data was applied to keep the well within the TVD tolerance and place the well in the target reservoir. Drilling torque friction factor started relatively high when drilling out of the casing shoe; however, it stabilized between friction factor of 0.20-0.25. Stick slip varied between 30-290 peak-to-peak RPM difference. If torque friction factor remained at 0.25, TD would have been torque-limited to 27,000 ft with the 5-in. drill pipe with API connections. Lubricant was added from 20,500 ft onwards at 2% concentration initially. Torque friction factor improved to 0.19-0.21 after the addition of lubricant in the mud system. At 23,630 ft (after drilling 18,859 ft of 8 ½-in. hole), communication with the rotary steerable tool was lost, and the BHA was pulled out of hole. This graph shows record wells by Maersk Oil Qatar. 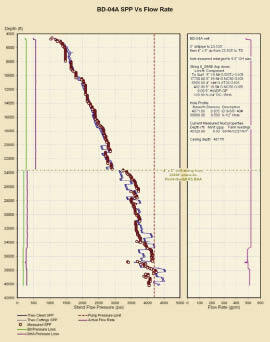 In 1994, 10,220 ft was the longest horizontal length drilled by MOQ. At this point, it was decided to extend the TD of 28,850 ft. Torque and drag modeling indicated that the expected torque loads at the extended TD would exceed the capability of the drillstring and top drive; ECD loads would also be prohibitively high if drilling was continued with the 5-in. drillstring, even with hole enlargement to 9 ½ in. Further modeling indicated that a tapered drillstring of 4-in. by 5-in. drill pipe would be acceptable for torque and ECD loads. Using a 4-in. by 5-in. tapered drillstring, however, would result in higher pump pressure and reduced flow rate at TD. The length of the 4-in. drill pipe was critical in order to balance these conflicting needs. Further evaluations were made to prioritise the needs, and a balance was struck with approximately 7,000 ft of 4-in. drill pipe in a tapered drillstring design. As part of the torque mitigation efforts, 15,000 ft of 5-in. 19.5-ppf drill pipe with high-torque connections were also included in the top part of the drillstring. A point-the-bit rotary steerable BHA was selected as it requires much less pressure drop across the tool to operate compared with a push-the-bit system. Larger nozzles TFA were also selected for the bit, further improving the pump pressure and flow rate at TD. Another key to maximizing the performance of the rotary steerable BHA was reducing downhole shocks and vibrations to minimize the negative effects on tool life and to increase overall ROP. It was tried to reduce vibrations (stick-slip, BHA whirl, torque, etc) with drilling parameters initially, and lubricant was used in the mud system. A drilling mechanics log was also obtained for better understanding of the causes of vibrations. 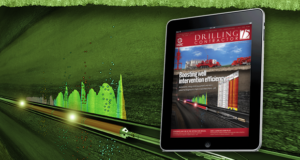 The downhole assembly provided comprehensive data for real-time and post-job analysis of drillstring dynamics. 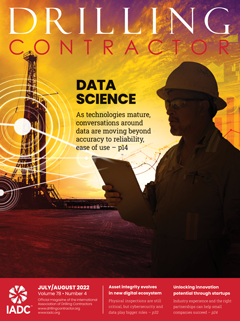 This process enabled development of drilling practices to reduce downhole shocks and vibrations that ultimately enabled developing correlations between surface and downhole WOB and torque for use in future ERD wells. The 4-in. by 5-in. tapered drillstring with point-the-bit rotary steerable BHA was tripped in positive weight to 22,376 ft and reamed/washed down to bottom due to negative weight. 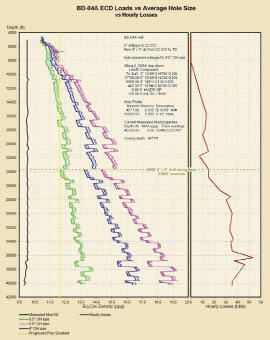 Drilling continued ahead from 23,630 ft to 33,877 ft at an average ROP of 120 ft/hr. Drilling torque was tracking between friction factor of 0.18-0.21, which was to be within the top drive limit when projecting ahead at the extended TD. Stick slip averaged 30-290 peak-to-peak RPM difference. Downhole static losses increased to 25-34 bbl/hr from 26,600 ft onwards. 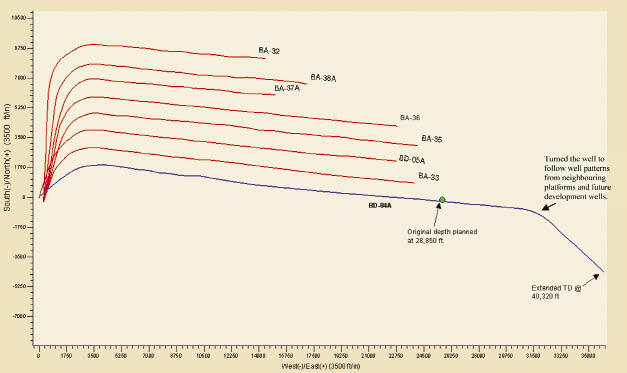 This plot shows BD-04A’s measured off-bottom and drilling torque in the 8½-in. reservoir hole. At 33,877 ft, a wiper trip was performed to 18,307 ft to reposition the high-torque drill pipes. The drillstring was then tripped in positive weight to 26,585 ft and reamed/washed down to bottom. The ability to trip in positive weight to 26,585 ft indicated that the hole condition was good. The lubricant concentration was increased from 2% to 3% at 28,000 ft. The increase was necessary not only for torque reasons but also to reduce the severity of stick slip for ROP improvement and preservation of downhole tools. Drilling torque friction factor did not show significant improvement when the lubricant concentration was increased. A 35° azimuth turn to the right was executed as per the extended-TD well path from 33,500 ft to 36,000 ft to align the well with the next development phase line-drive pattern wells. While drilling ahead at 36,630 ft, the drilling torque peaked to 36,000-39,000 ft-lbs (average prior was 32,000-33,000 ft-lbs). This coincided with higher lost-circulation rates experienced at that depth. The torque peak was probably due to azimuth turn. A precautionary wiper trip was made to 33,500 ft and washed/reamed down to bottom. Drilling resumed at an average ROP of 120-135 ft/hr and drilling torque of 32,000-35,000 ft-lbs (friction factor of 0.18-0.21) to the TD of 40,320 ft.
Geosteering is critical to drill and position the wellbore in the target formation as the reservoir is approximately 10 ft thick and faulted. It was applied through the entire reservoir section with assistance from LWD data. Formation evaluation information such as gamma ray, azimuthally focused laterolog resistivity, bit resistivity, porosity and bulk density were utilized to make real-time geosteering decisions. At the TD of 40,320 ft, mud pulse signals from MWD and LWD were ion the wellbore in the target formation as the reservoir is approximately 10 ft thick and faulted. It was applied through the entire reservoir section with assistance from LWD data. Formation evaluation information such as gamma ray, azimuthally focused laterolog resistivity, bit resistivity, porosity and bulk density were utilized to make real-time geosteering decisions. At the TD of 40,320 ft, mud pulse signals from MWD and LWD were still transmitted and detectable using standard equipment. The data rate of transmission was reduced from 3 bps to 1.5 bps from 35,000 ft onward to improve the data quality. Drilling the BD-04A well to 40,320 ft would not have been feasible prior to MOQ’s initiative in late 2007 to review the reasons for reach limitations in the Al-Shaheen Field. The aim of the review was to expand reach capability as the need for longer-reach wells may arise in the future development phase of Al-Shaheen. The 2007 review, amongst others, indicated that both reach and ROP in an 8 ½-in. hole section, at that time, were constrained by drill pipe connections torque capacity and ECD loads, rather than top drive or rig capability. This plot shows BD-04A’s calculated ECD loads with sensitivity analysis on open-hole size and observed lost-circulation rate. As a result, de-bottlenecking efforts (designing the tapered drillstring) began with acquiring 5-in. drill pipe with higher torque connections, as well as the introduction of a section of 4-in. drill pipe. These equipment upgrades contributed to the success of BD-04A. The net and immediate benefits after the combination drillstring was picked up are listed in Table 1. 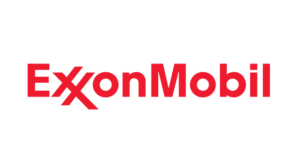 • Drill pipe upgrades to high-torque connection to maximize the torque capability of the top drive. • A tapered drillstring design with slim OD drill pipe in the lower part, for torque loads reduction, as well as ECD improvement. Slim-OD drill pipe have the added benefit of slightly reducing friction factor. • Use of lubricant in the mud system for drilling torque and stick slip mitigation. • Increased focus on ECD management. Previous wells have all been torque-limited. TD was forced on when ECD induced losses are intolerable or ROP too low. ECD management included reliance of hole enlargement with the mud system, tapered drillstring design with a section of slim-OD drill pipes and thin rheology mud. • Emphasis was put on the quality well path to minimize unnecessary doglegs for improved torque and drag. • The use of RSS in the continuous build top-hole sections, resulting in a smooth catenary wellbore curve, which helped to push the ERD limits. Based on the drilling torque friction factors encountered in BD-04A, TD would have been torque-limited to +/- 30,000 ft with the original equipment of 5-in. drill pipe with API tool joints and possibly even less, as the ECDs would have been higher, resulting in intolerable lost-circulation rates. As such, MOQ’s equipment upgrades were directly responsible for at least +/- 10,000 ft of additional reach. BD-04A was terminated at 40,320 ft due to logistical reasons and after a thorough risk assessment. 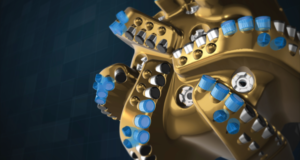 The torque loads were still within the capability of the drillstring design, top drive and rig capability. Simulations indicate that if drilling had been continued, it was likely that a TD of ± 44,000 ft would have been possible where it would’ve been limited by the top drive capability, assuming the ECD-induced lost circulation rate was still within the acceptable range. The BD-04A well has pushed the industry extended-reach drilling envelope for shallow wells to new heights with fit-for-purpose design and appropriate practices. Torque was the limiting factor in determining the well’s reach. ECD management was integral to the overall torque management, and the use of mud lubricant was necessary to reduce the friction factor to a manageable level for the LSND water-based mud system. ECD loads are higher with increasing reach, and it was amplified with the shallow TVD of Al-Shaheen reservoirs. If ECD loads were not managed, intolerable lost circulation rates would have led to the replacement of drilling fluid containing lubricant to seawater, pushing the friction factor higher, hence reaching the torque limit long before planned TD. BD-04A’s measured standpipe pressure and actual flow rate plot. 1. 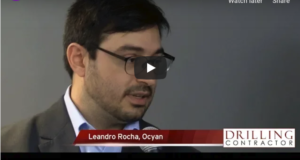 Knowing what are limiting factors to pushing the operating envelope further. Torque and drag review of offset wells indicated torque was not limited by the top drive but by the connection of the 5-in. drill pipe. With the use of up to 10,000 ft of 5-in. 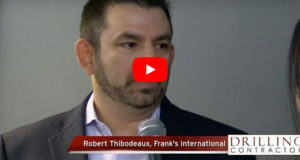 drill pipe with high-torque connection, the torque limit was increased from 32,000 ft-lbs (connection limited) to the top drive limit of 40,000 ft-lbs. 2. Fit-for-purpose drillstring design. Torque and drag modeling indicated that BD-04A torque was sensitive to the side loads in the horizontal section. Lighter drill pipe will generate less side loads, hence less torque. A tapered drillstring design with a section of lighter-weight 4-in. 14-ppf drill pipe placed above the BHA can effectively reduce torque. 3. Focus on ECD management. This is a critical priority, given that mud is necessary for torque management. Previous wells were torque-limited, with TD usually forced on once torque loads became unacceptable. ECD management included use of the 5-in. by 4-in. tapered drillstring and thinner rheology fluids. Model showed that ECD loads were very sensitive to hole size and mud rheology. 4. Training and practices. The margin of error for BD-04A was very narrow. 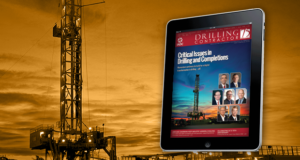 The hole cleaning and tripping behavior are a step-change from conventional wells. 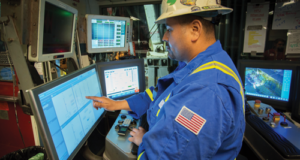 Extended-reach drilling operation practices training are key to familiarize operations personnel with the appropriate practices for drilling, tripping, pipe buckling management and making connections to avoid stuck pipe or self-inflicted damage to the wellbore. 5. Hole condition monitoring. Real-time monitoring of torque and drag and ECD trends and comparison with the theoretical trends enables identification of potential problems and timely corrective actions. Hole condition monitoring was also used to project the torque and drag and ECD loads to TD based on the actual drilling condition. Fine-tuning of drilling parameters and drillstring design were made to ensure TD of the well was reached within the equipment limitation. It was also used for ROP optimization. WOB was limited by buckling of the 4-in. 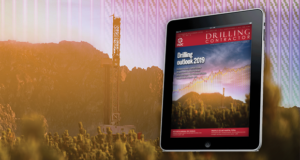 drill pipe, a “maximum allowable WOB” roadmap was generated based on the actual drilling condition, and optimum WOB within the buckling limit was used to maximize ROP. 6. 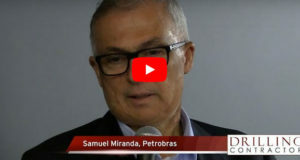 The spin-off benefits from this record well have been extended and implemented across the board on all wells drilled, resulting in ROP improvement, torque and drag mitigation, ECD management, extending the reach of sandstone Nahr Umr wells and drilling multilaterals. SPE/IADC 119506, “How Continuous Improvement Lead to the Longest Horizontal Well in the World,” was presented at the 2009 SPE/IADC Drilling Conference & Exhibition, 17-19 March 2009, Amsterdam, Netherlands. AHD: Along Hole Departure is the sum of the displacement between individual survey stations. It is a measure of true departure in a well essentially stretching a well straight, like a string. So a well with no azimuth change will have a surface to TD departure equal to the AHD. 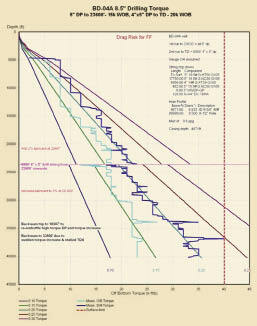 DDI: Directional Difficulty Index is high level performance measure used to benchmark drilling performance. It becomes especially useful when used as an evaluation method on complex well geometries. It provides a first pass evaluation of the relative difficulty to be encountered in drilling a directional well. ERD ratio: This is the AHD-to-TVD ratio. Essentially it gives a ratio of the total displacement (AHD) to the true vertical depth. It can be considered as a measure of the drilling envelope in extended-reach horizontal drilling. Stick-slip: Stick-slip is a differential measurement of the maximum and minimum RPM of the drillstring downhole, measured since the last time the stick-slip d-point was sent uphole. Severity of Stick Slip is relative to the surface RPM, and is not indicated by its absolute numbers. Can be expressed as peak to peak RPM difference or in percentage terms. 1) Abbasy, I., White, B. and Pitts, M: “Challenges in completing long horizontal wells selectively,” SPE 116541. 2) Oag, A.W., Williams, M: “The Directional Difficulty Index – A new approach to performance benchmarking,” SPE 59196. 3) Thomasen, J.B: “Realizing the potential of Marginal Reservoirs: The Al-Shaheen field offshore Qatar,” IPTC 10854, Nov 2005.